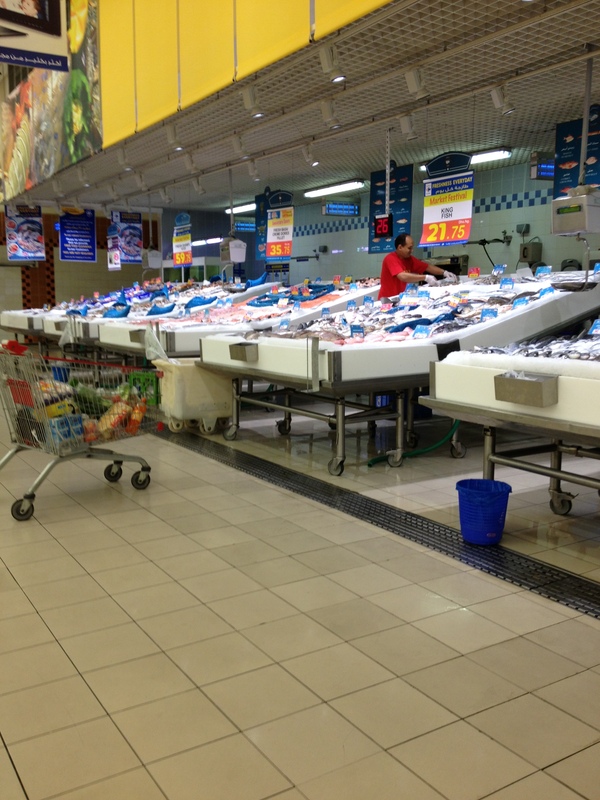 Grocery shopping here is different from what I was accustomed to in the US – not a HUGE change, but different. There are no “Super WalMart” stores here, but there are grocery store chains as well as smaller, privately-owned shops. 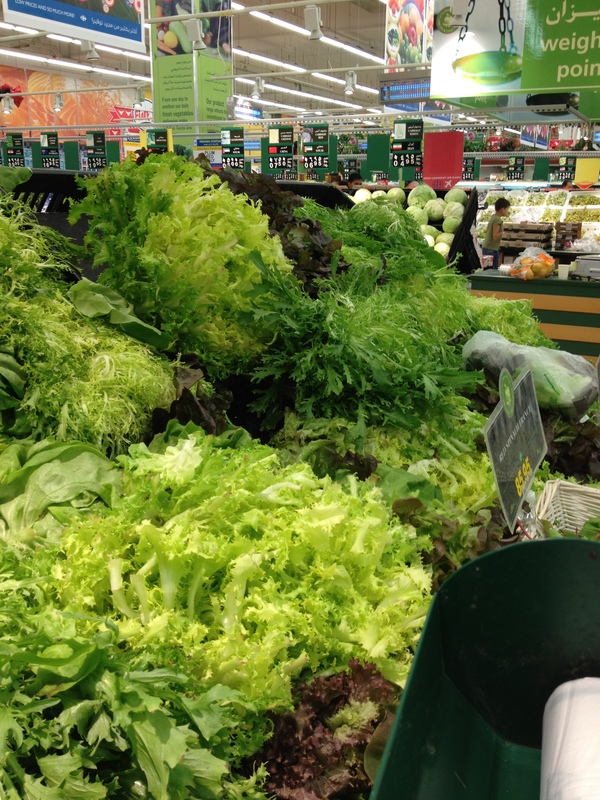 In order to find what our family enjoys in terms of food often requires several shops and multiple trips, as well as a bit of sleuthing on your part, or an extremely helpful store clerk. 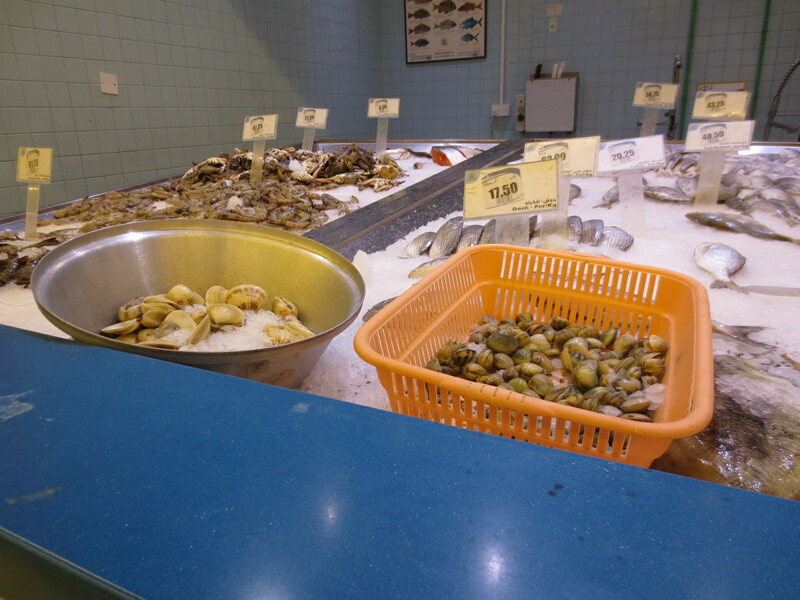 Produce here is widely available, and from all countries you can imagine. We routinely eat nectarines from South Africa, garlic from China, limes from Brazil, grapes from Cyprus, zucchini (called courgettes here! 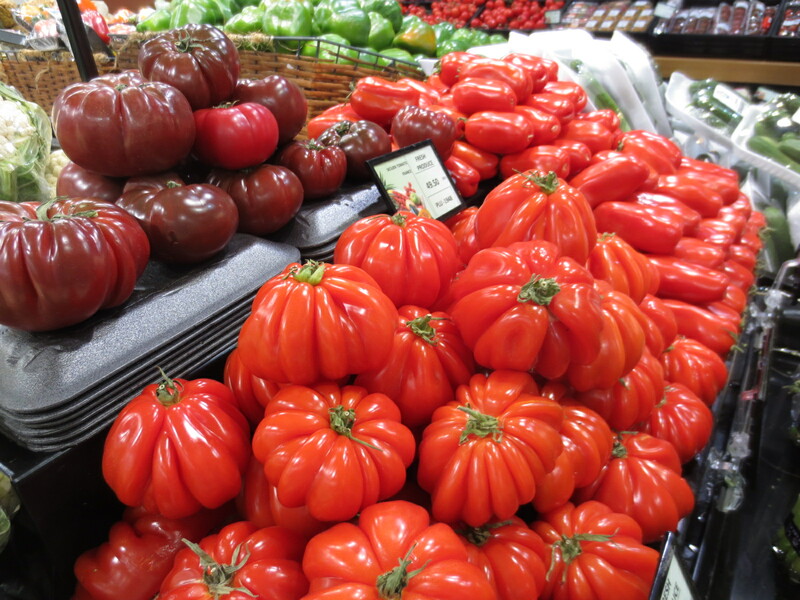 ), tomatoes, cucumbers and green peppers are often grown locally, and have excellent flavor. 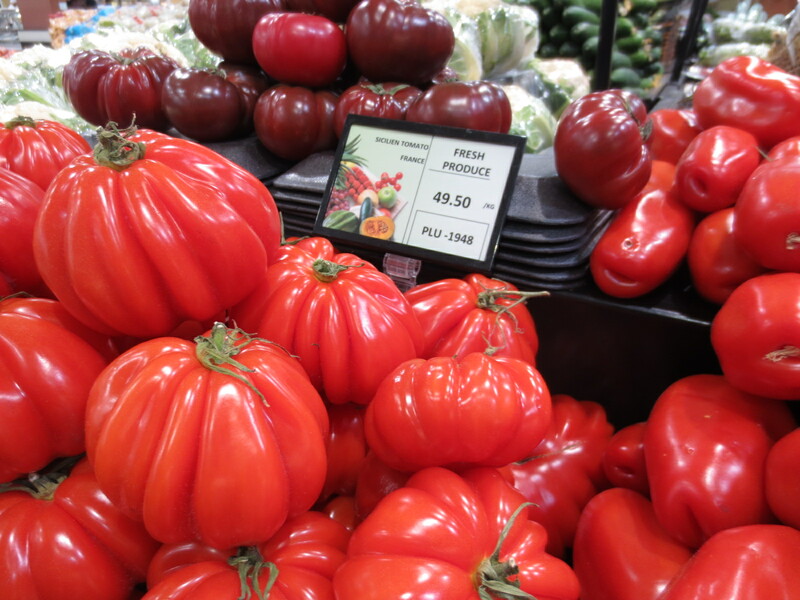 Check out these tomatoes I saw at the local Spinney’s grocery store this weekend, aren’t they luscious looking?? 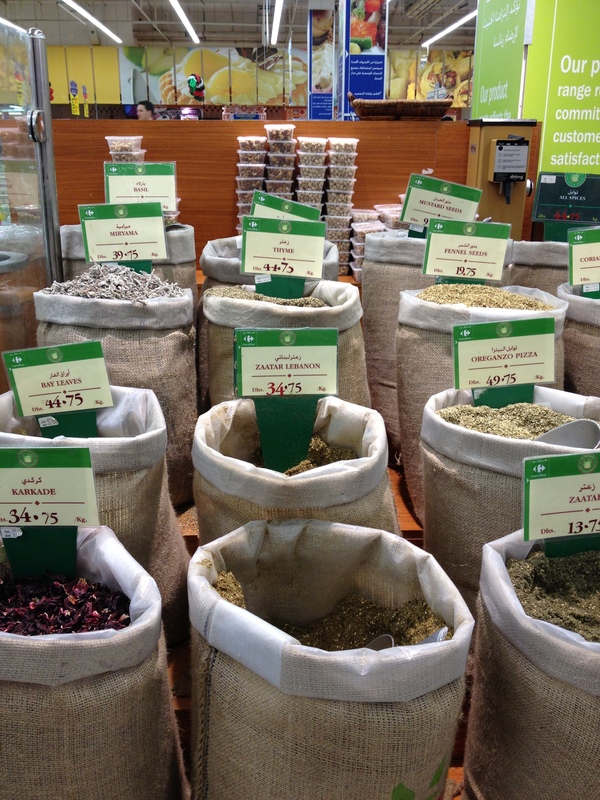 Herbs and spices are abundant as well, and are used in a myriad of dishes. Catering to the extensive expat community here, the groceries carry an amazing array of vegetables and fruits – there’s always something new to try! OOhh…. 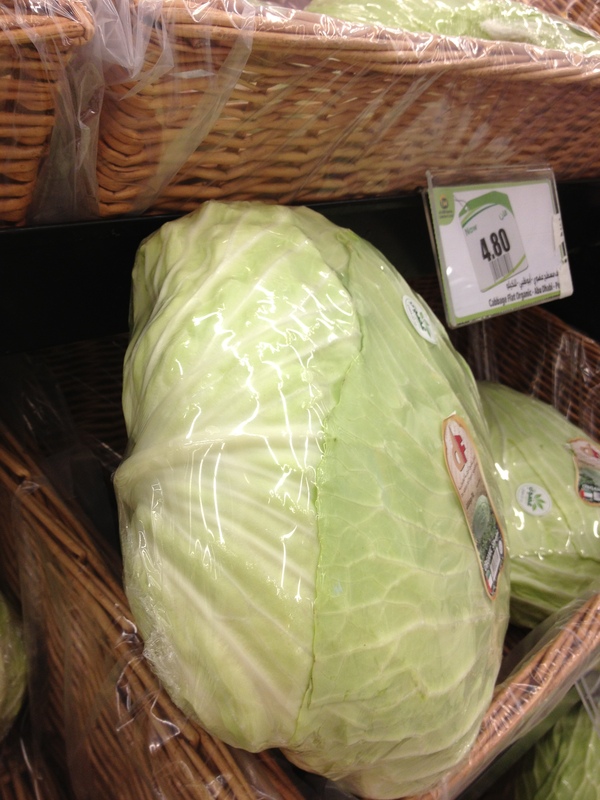 something *brilliant* that is common here that I lovelovelove….. you get your produce weighed and priced IN THE PRODUCE DEPARTMENT! By people that actually know what a white radish is…. and don’t charge you for a “carrot” at the checkout. Only one set of scales, and the checkout clerks simply scan and bag. Brilliant! 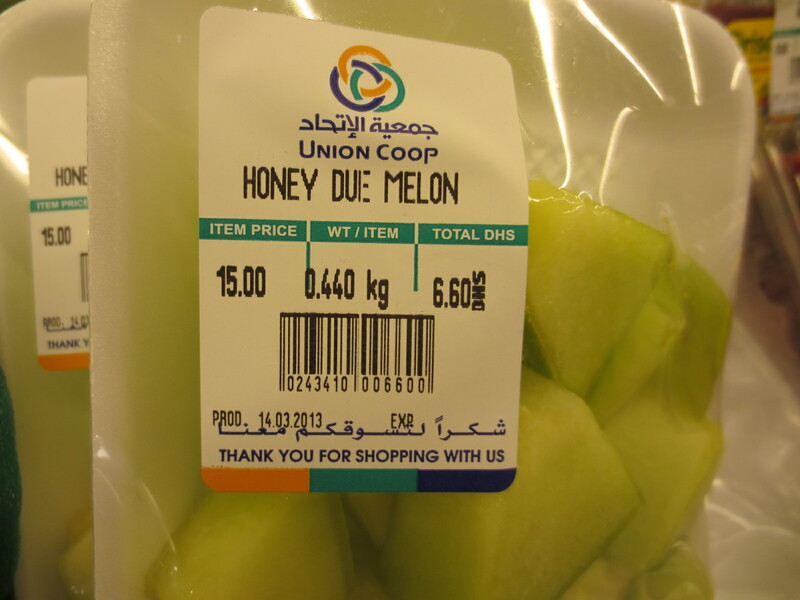 I get tickled at some of the labels on foods here – they’re generally a literal or phonetic interpretation of some sort, but always good for a smile…. 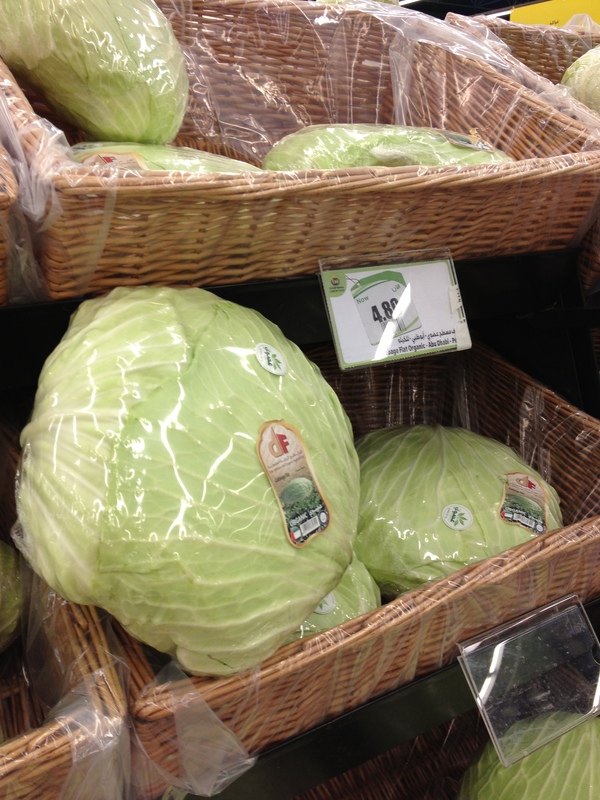 Check out these amazing looking cabbages – they’re quite flat, very dense, and have a “sharper” taste than the round ball-shaped cabbages I’m accustomed to in the US. Pretty cool-looking aren’t they?? Many times, I’ve not known what a specific vegetable fruit or spice is used for, or how to prepare it…. but I’ve found that simply asking another woman that’s choosing that item will generally end up in some sort of idea, or at least an attempt to communicate how to cook it. Thank goodness a fellow shopper steered me away from those tiny cute little peppers, and suggested the larger, milder ones – that dish would have been inedible! 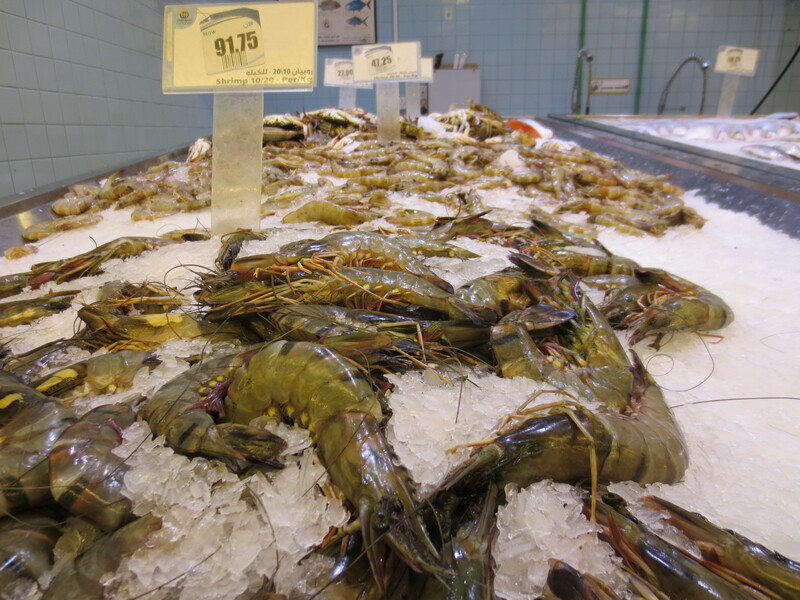 There are some awesome and quite artful displays of food here, and none less colorful than the seafood – rainbow-glistening fish, brightly-striped prawns, and hard shells just daring you to open them and see how pretty they are just inside! 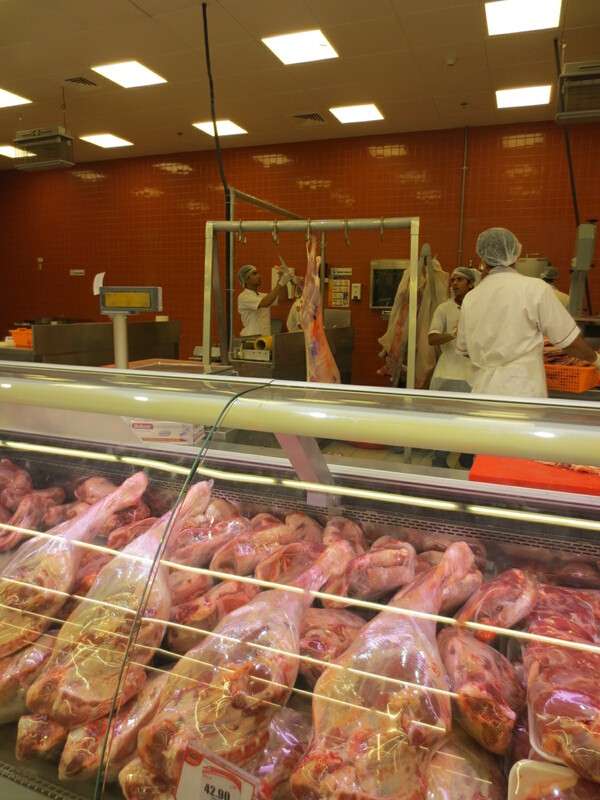 I’ve come to understand that my expectations are not common to this area… for example – what a local meat counter looks like here. 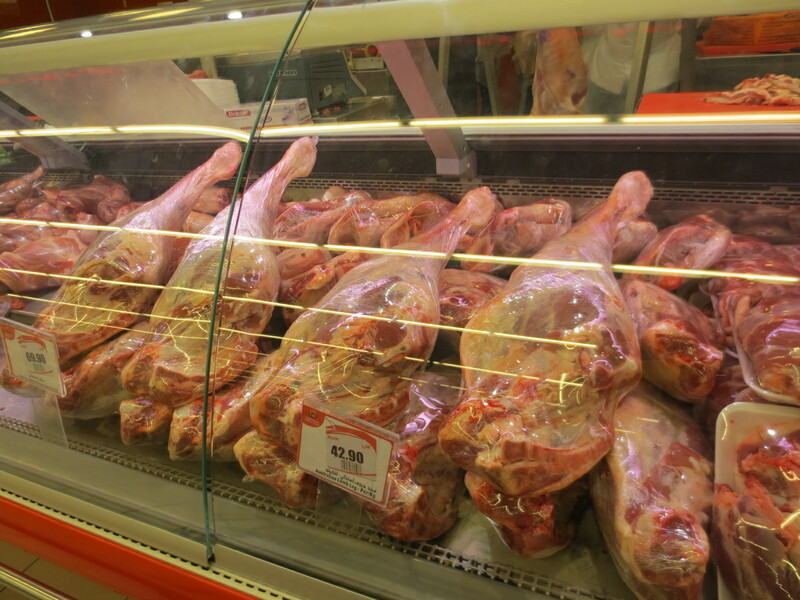 My western eyes were expecting some small packages with portion-sized bits of meats….lol… not at this store! Take a look at the size of these! 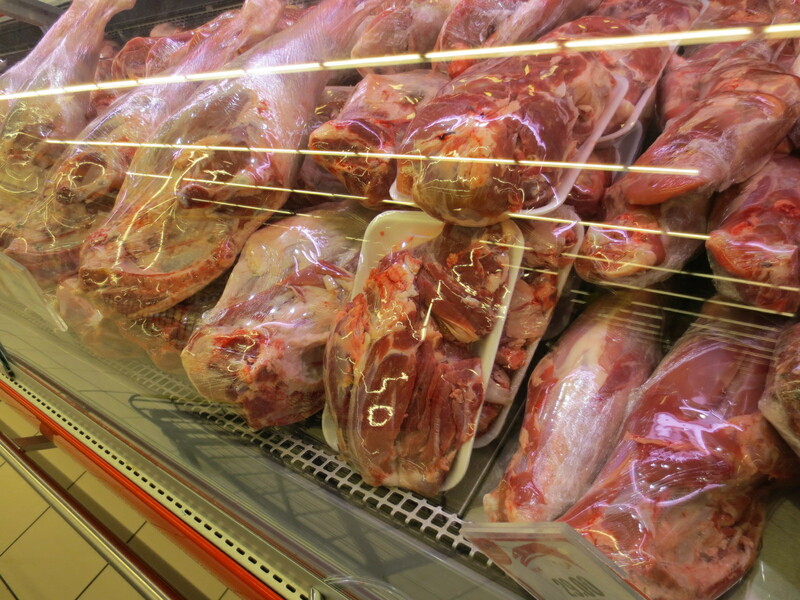 Now granted, *all* meat counters are not like this, but some are. 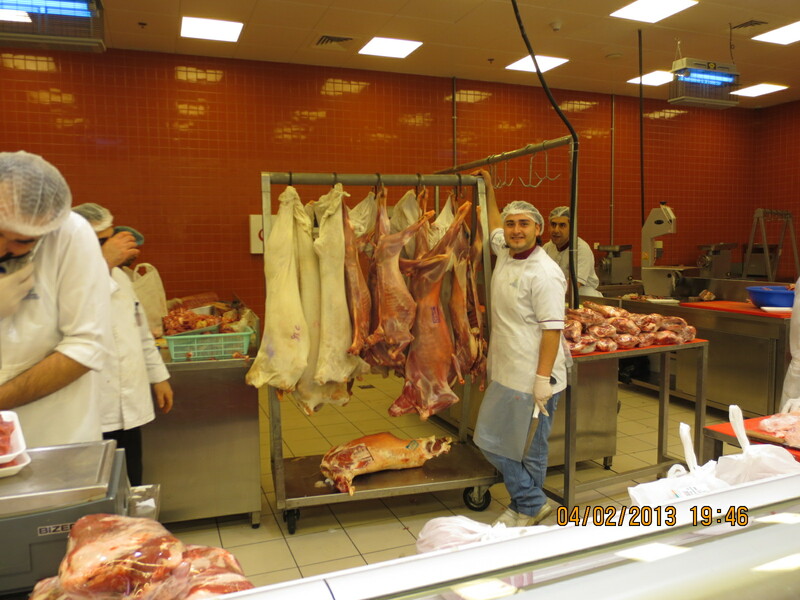 These gents were hard at work back behind this meat counter….. see how nicely all the various cuts are displayed? 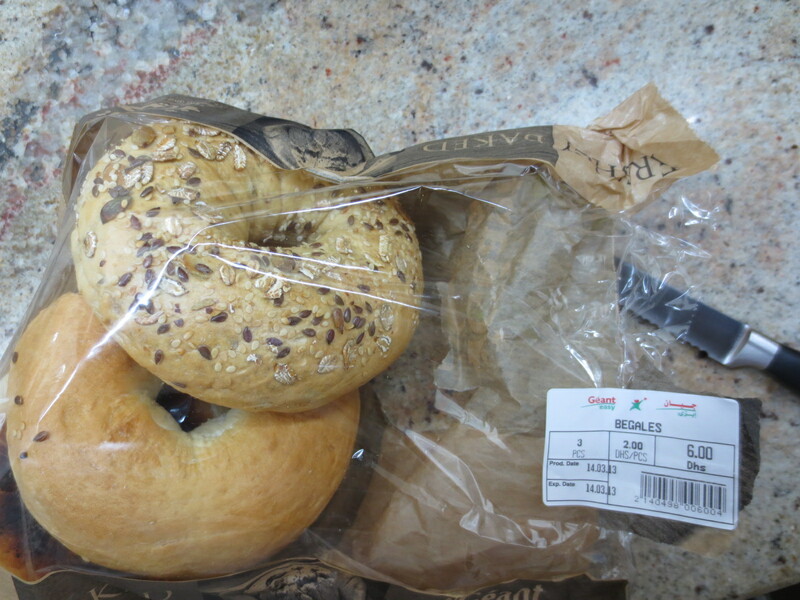 And they’re labeled with country of origin, price, etc. But how did they get into that display counter? Well, take a look behind the scenes….. 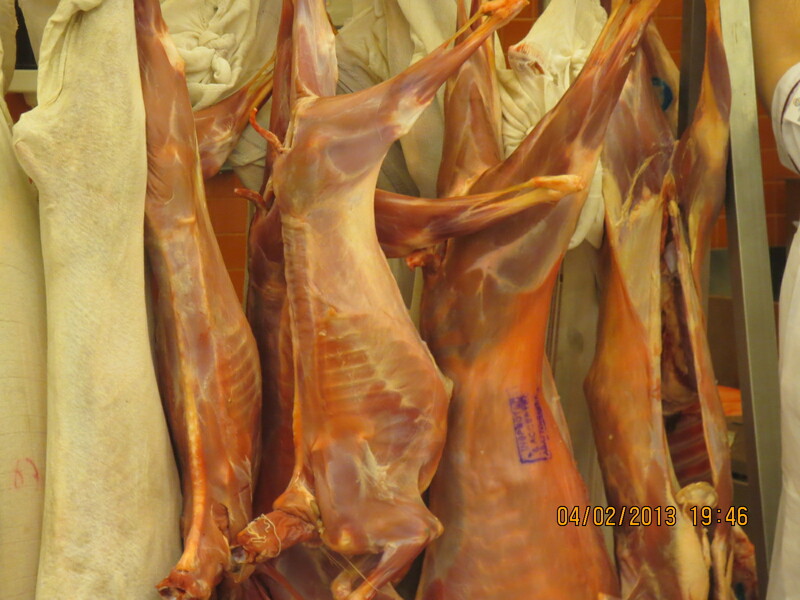 I had noticed a large rack being wheeled into the sawing/cutting area of this meat section….. filled with carcasses of critters that Ididnotknowwhatthehecktheywere. I gestured to the gents “could I take your photos?” And one began posing, one began covering the carcasses with their original burlap bags, another said “nah, she wants a photo of the critter” (my guessterpation of his native-language comment) and they removed the bags. And knocked a carcass off its hanging hook to the floor. And picked it back up and hung it again. Like I’ve said….. things are different here.